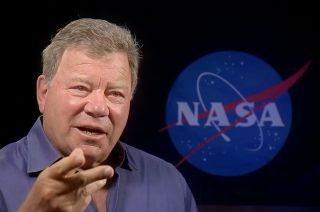 William Shatner, seen here in a 2016 NASA video, has signed up to take a weightless flight with the Zero Gravity Corporation on Aug. 4, 2017. This August, William Shatner will get closer to the final frontier than he ever did in his "Star Trek" days. The 86-year-old actor, who famously portrayed Captain James T. Kirk in the original "Star Trek" TV series and a number of movies, has signed up for an Aug. 4 flight with the Zero Gravity Corporation (Zero-G). The Virginia-based company sells rides on its modified Boeing 727 aircraft G-Force One, which flies in a series of parabolic arcs to give passengers brief tastes of weightlessness. "Going weightless will turn a dream into reality," Shatner said in a statement. "I've always wondered what it would be like to actually explore the final frontier, and now I have the opportunity to experience zero gravity firsthand. It will be an incredible adventure." You have a chance to share this adventure with Shatner, if you wish: Zero-G is selling a limited number of tickets aboard the actor's flight for $9,950 apiece, plus 5 percent tax. (For perspective: a seat aboard a normal Zero-G flight runs $4,950, plus 5 percent tax.) Go to Zero-G's website if you're interested. Shatner will be following in the footsteps of fellow "Star Trek" alum George Takei, who played crewmember Hikaru Sulu. Takei flew with fans aboard a special Zero-G flight in August 2016, to help celebrate the 50th anniversary of the iconic TV series' debut. And in September 2015, Nichelle Nichols, who portrayed Lt. Uhura on the show, took a space-related flight of a different nature. She flew with scientists and educators aboard NASA's Stratospheric Observatory for Infrared Astronomy (SOFIA), a Boeing 747 equipped with a 100-inch (2.5 meters) telescope. During the 10-hour flight, SOFIA studied several different star-forming regions, as well as a protostar in the constellation Taurus. Nichols and her fellow "Airborne Astronomy Ambassadors" answered fans' and students' questions throughout the flight and during their preflight training.